Even in this offbeat corner of the business world, success is a function of intelligence, strategy, and analytical decision-making. Very seasonal: big thanks to James Golick and John Baku for really making me think; to Paul Dix for making me take my startup ideas more seriously; to Courtenay Gasking for being a very accomodating boss (a year or so ago) and giving me the opportunity to work with (and thereby learn from) amazing programmers like Rick Olson, Kyle Neath, Jeremy McAnally, Trevor Squires, Courtenay himself, and several others; to Frank Wimberly for helping me understand statistical AI; to my customers and coaching clients for all the business over the past year; to everyone who's bought anything through an affiliate link on my site; to all my readers and Twitter followers; to my awesome landlords for hooking me up with such a fantastic apartment; to my acting teachers for teaching me so crazy much, especially Jen Krater and Larry Drake; to Evan Phoenix and Shane Becker for rb.la; to Coby Randquist, Alf Mikula, and many many others for LA Ruby; to everyone who's had me speak at their awesome conferences; to Pete Forde, for special secret favors (ooh la la); to you for reading this; and to so many other people that I can't remember at the moment, my bad for that. Recently, James Golick tweeted the question this post answers. I'm going into detail here because the answer is too long for a tweet, and I'm currently on a self-imposed Twitter ban (I'm not allowing myself back onto Twitter until I've written my own client which enforces my own, very idiosyncratic idea of an ideal Twitter user experience). The most important thing to understand is that to my knowledge only one researcher has investigated this question in detail and with exclusive focus; that researcher is Mihaly Csikszentmihalyi, and he summarizes his research in the essential book Flow: The Psychology of Optimal Experience. Csikszentmihalyi's term "flow" expresses the same essential concept as "getting in the zone." A flow state is a state where a person experiences no consciousness of anything except the task at hand. The second and third most important things to understand are 2) that regular experiences of a flow state are the consistent unifying feature of the lives of happy people, and 3) that achieving a flow state requires only two things: that the task at hand be both achievable enough to supply a reward experience of some kind within a relatively short time frame, and that the task at hand be difficult enough that success requires engrossing concentration. When faced with tasks that are neither achievable nor challenging, flow is impossible; otherwise, all you have to do to achieve flow is segment your tasks into chunks which are both achievable and difficult. A very important, related data point: procrastination occurs most frequently in the context of vaguely-defined tasks. Thus the same segmenting which sets you up for flow also minimizes procrastination. It also cures depression, or at least, it did in my case. When I first learned point 2, that flow experiences are the consistent unifying feature of the lives of happy people, I immediately began to train myself on drum essentials like paradiddles. I did this because I was depressed at the time, probably suffering from clinical depression in fact. It cured me of that problem, and I had known from the research that it would. The drum techniques were both achievable and difficult, which made learning them a guarantor of flow, which made me a happy person. Sibilant is an awesome project which allows you to write Node.js web apps in Lisp. I used it to create missing-rubyconf.gilesb.com, a simple Twitter scanner which catches tweets about RubyConf. The code is on GitHub. A little while back, a Disqus plugin annoyed me in some way. I don't remember how, but I do remember that I tweeted Disqus about it, and they fixed it, mostly. I've decided to return the favor. 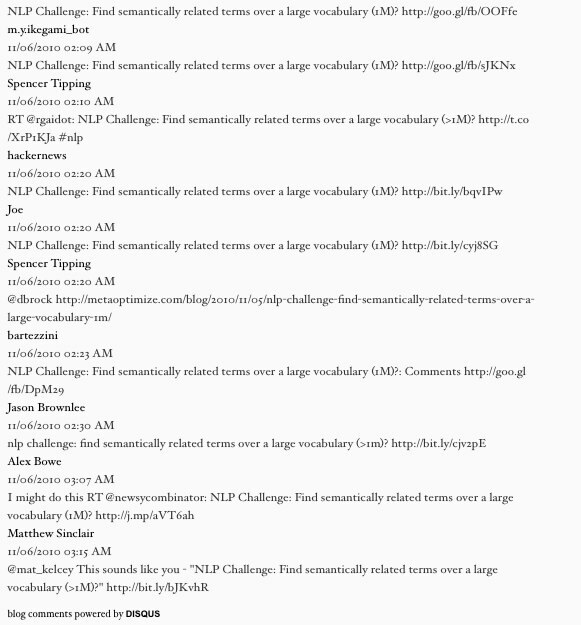 Yesterday, the MetaOptimize blog post NLP Challenge: Find semantically related terms over a large vocabulary (>1M)? attracted a ton of retweets on Twitter. 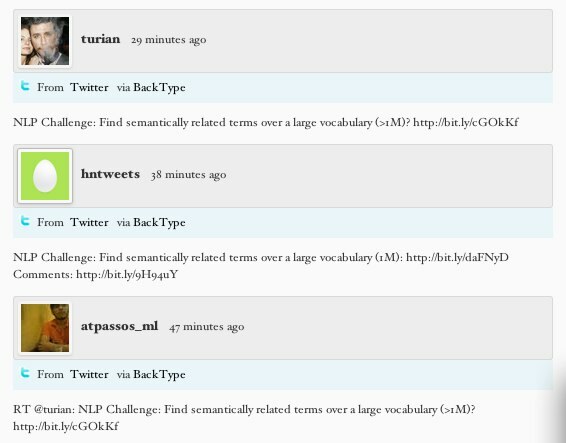 A Disqus plugin on the blog post adds those RTs to the post as "comments," using a system called BackType. For instance, in this screenshot, the top "comment" comes from a guy called turian, and the bottom comment retweets him. But if you look in the middle, there's a nearly identical tweet with no actual "RT" string. That's because it comes from @hntweets, which apparently tweets links found on Hacker News, and is apparently not the only such account. Here's another account which Disqus also posted as a "comment" on the MetaOptimize blog post. There was a third one, too, which I spotted, and probably others that I didn't. I don't know why so many people want to build Twitter bots that retweet links on Hacker News, but I don't see them stopping any time soon, either. Likewise, systems like BackType are systematically vulnerable to spam and noise; for instance, Disqus picked up my tweet complaining about their signal/noise problem as a "trackback." A spammer could easily tweet a link to the post along with "ch3ap vi4gra here," and, more to the point, a spammer could easily write a script to identify every site that uses Disqus and another script to tweet "ch3ap vi4gra here" along with a link to every blog post on every such site. This means that a spammer could easily fill an entire screen with "che4p vi4gra here," just by submitting the same URL to a variety of URL shorteners. Here's another screenshot from the same blog post, further down the page, where Disqus posted a ton more tweets as alleged "trackbacks." Again, many feature very minor variations, and none are worth reading. And the only bit you'd have to think about would be the process of including the Zepto library in a bookmarklet. I've never done that, but it's probably easy. The code knows how to skip highly similar tweets like "foo http://bar" and "RT @baz: foo http://bar", but it doesn't know how to split text strings on hyphens, which would eliminate even more repetition, so if you want to understand this code, get in there and add that trivial feature. The code is simple, brief, and well-commented. It's 146 lines with sample data and comments, 37 lines without. Check it out on GitHub. Typography Music Video: Marlon Deja "Million Years"
I'm reading a neat book called The Millionaire Next Door, about how the majority of American millionaires and multi-millionaires live modest lives almost utterly devoid of bling, and I have to say, I'm really glad I bought it on Amazon, because it's a very interesting book, but if I had seen it in a store, I never would have bought it. This is because the cover features an admiring quote from Rush Limbaugh. What kind of idiot wants to read a book about self-discipline and personal responsibility which is endorsed by an obese drug addict? What's next, How To Get Into Harvard, written by Sarah Palin? Anyway, despite the obvious insanity of whoever is marketing this thing, or perhaps the obvious insanity of the world it's being marketed in, the book is worth a read. And if an obese drug addict can endorse a book about self-discipline and personal responsibility, why can't a painfully recently-failed entrepreneur with no cash endorse a book about multi-millionaires? Seriously, it's well-researched, it documents something counter-intuitive, and it gives insights into how to get rich. All interesting places to start.